Why buy roast chicken from the store that has been sitting around for hours waiting to be bought ,when you can get fresh roast chicken straight out of the oven at home!? 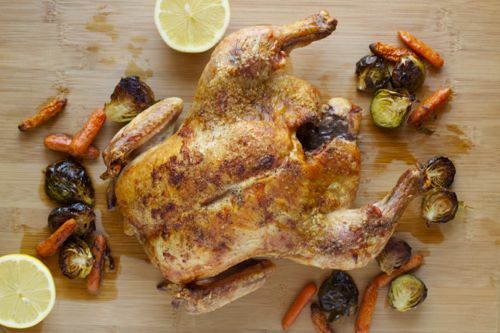 Follow my easy recipe for this perfect roast chicken! Nothing compares to fresh roast chicken straight out of the oven. The crispy skin and the tender meat, so juicy and flavorful, you will never buy store bought again! Once a week, we have roast chicken with roast vegetables and a nice fresh salad on the side. Comfort food at its greatest. Of course, we always have left overs, which is the best part because, that means I don’t have to make dinner the next night 🙂 Regardless of anything, this meal is always satisfying and so easy to make. Now, I know the chicken can be a little intimidating but it really isn’t. It just takes a couple of ingredients and bam! You have just made a gourmet meal that will beat any take-out chicken out there! 2. Wash the chicken under cold water and pat dry. 3. Place chicken, breast side up, on a greased foil-lined baking sheet and tuck the wings behind its back to prevent tips from burning. 4. Rub 2 tsp of olive oil all over the chicken and season the inside of the chicken with 1 tsp of salt and 1/4 tsp of pepper. 5. Stuff the chicken with thyme, lemon and garlic. 6. Season the outside of the chicken with the remaining 1 1/2 tsp of salt and 1/2 tsp of pepper. 7. Bake for 45 minutes, rotate the baking sheet. 8. Bake for another hour for a total of 1 hour and 45 minutes. 9. Remove from the oven and allow chicken to rest for 10 minutes.